I have a massive old California oak tree in my front yard. My arborist and his crew were working nearby and stopped by to check the tree. It needed shaping, balancing and trimming away the debris. In nature it wouldn’t matter how this great oak tree grew, but sharing space with my home, I need to have it trimmed and shaped in order for me to keep it from dropping branches on my roof or the roof of my neighbor and to clear away the debris that died out and is still clinging. I thought this an appropriate metaphor for the coming New Year — this being the last day of 2014 and a wonderful way of welcoming in 2015 with infinite possibilities after clearing away all the old. Much of what we seem to do with our lives in preparation for the New Year or what all the New Year Resolutions are about. I do love that old tree. It was here before the house was built. In the olden days, women would protest by chaining themselves to the trunk of the tree to keep the contractors from cutting them down. This one in my front yard was saved. One down the street recently died due to lack of care with the lack of water and the owner not caring enough to give it proper nutrition and water. I suppose when I bought the house, this tree was put in my care. It’s important for me to take this responsibility seriously and to do what I can to nurture it to grow abundantly long after I’m gone and forgotten. The estimates on the age of this tree range from 150 to 200 years. I do wonder. Well, we’re celebrating another New Year. This one we’ll ring in with it being fully trimmed and cleaned up. It brings gladness to my heart to take away some of the weight from the mighty branches and allow her to stand tall and majestically for all to see. With the wind and the cold we’re experiencing out of Canada today, I’m wondering if my arborist heard her cry for help. It may seem strange, but she is a living tree. And all living things needs care and nurturing. She provides shade for me . 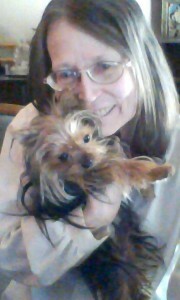 . . the least I can do for her is to trim her and to take some of her burden away for the New Year. May your burdens be cast away this last day of December, 2014 to bring in 2015 will joy and love, hope and prosperity. With the approaching of a New Year my thoughts turn to things I haven’t accomplished and wondering what opportunities will be coming my way. I do make a vow to myself to not worry about things, but to seek the good in everything I do. It’s important to wake up every morning with a smile on your face and happiness in your heart. I do believe we receive answers to our prayers . . . the trick is to be alert enough to recognize it. We are blessed in so very many ways. During Thanksgiving many took the time to think about their many blessings and spoke of the many things they were thankful for . . . it should be a daily thing of giving thanks for our many blessings . . . not wait for Thanksgiving. The same is true of Christmas . . . that Christmas spirit should still be with us . . . yes it is sometimes to difficult to keep those thoughts . . . it’s much much more fun decorating than it is putting everything away . . .
Then there’s New Year’s Eve . . . having a party . . . going to a party . . . or celebrating quietly at home. It can be a quiet time of reflection or a time to remember all the good times and thoughts about the coming year ahead. 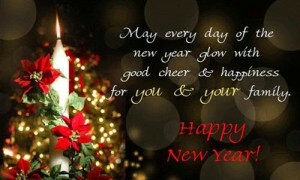 However you spend your New Year’s Eve, I wish you happiness and let it spread throughout the New Year! 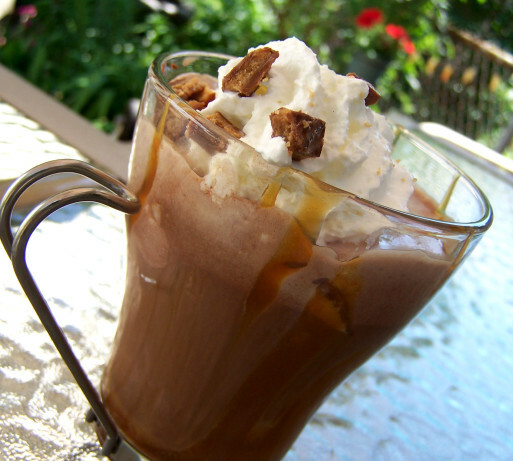 This coffee recipe will kick-start your New Year’s Eve celebrating off on the right foot. Mix the coffee, butterscotch topping and almond liqueur (optional) together. The images and free printables are compliments of http://family.disney.com These hats will give a fun Disney magic to help ring in the New Year at your New Year’s Eve Party. Bring in the New Year in style with this beautiful crown. Print out the template on card stock or regular paper. Cut it out and follow the directions. This is wonderful for the little princesses at your New Year’s Eve Party. I won’t let the gents out of this celebration. Of course Mickey will be on hand with this great New Year’s Eve top hat. Wouldn’t all the young men look dapper in this wonderful Happy New Year Top Hat? Add some feathers and this hat is ready to wear. Kids absolutely love Mickey and this Happy New Year Party Hat is a definite winner. 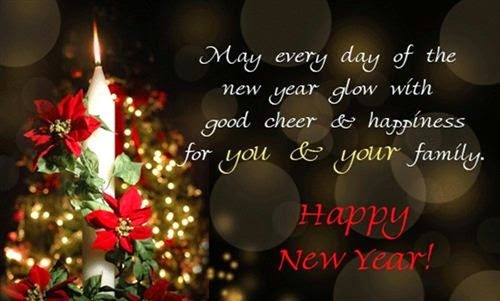 May you have a Healthy and Prosperous New Year!!! 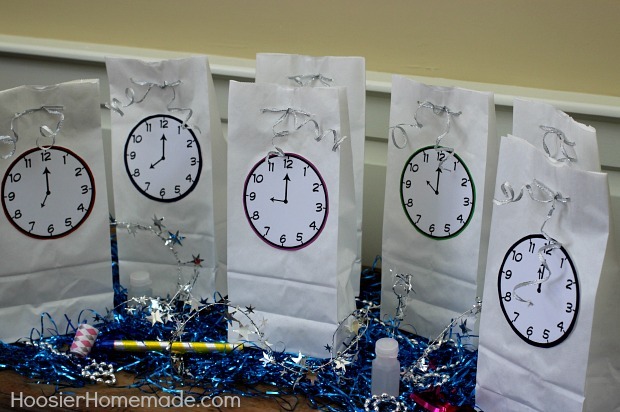 The concept behind these goodie bags is to keep your guests entertained until the final countdown bag at midnight. That’s where you’ll find the noise makers and whatever grand finale you want to put in the bag for your guests to bring in the New Year! The free printables clocks begin at 7, but you can begin your countdown at 9 or anytime, actually. It all depends upon how many goodies you’ve collected for your guests and when they may need a boost to remain awake until midnight. I combine family game night with my countdown to midnight. I have plenty of snacks, hot chocolate and coffee prepared. We also tell ghost stories and do some reminiscing about the good times we’ve shared on other New Year’s Eves and dream a bit about the goals and expectations for the New Year. One thing that is helpful is to have guests responsible for filling one countdown bag. It’s amazing what they find at craft stores, dollar stores, thrift shops and in bargain bins. Everyone contributes to the midnight bag as well. This adds to the excitement and the build up. This is a fun activity and every year it is different and fun.